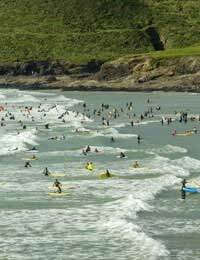 Wave skiing is popular in all the surfing corners of the globe and now this exciting blend of kayaking and surfing is being welcomed on the shores of the UK. Wave skiing or surf skiing, is a dynamic watersport that fuses the paddle power of canoeing with the manoeuvrability and stability of a surfboard. The wave skis themselves are long, narrow kayak-like boards powered with a kayak-like paddle, which excel at speed and tracking but at the expense of manoeuvrability and stability. They are shaped to turn easily on a wave-face, whilst at the same time retain enough bulk to aid paddling out. Unlike a kayak, there is no cockpit and so there are no worries about the craft filling with water. It is a competitive sport with participants competing for points scored from the variety and quality of moves performed on a wave. The British Wave Ski Association has been organising regular UK-wide competitions since the mid-eighties. Wave skis are shorter cousins of the surf ski, which are not performance boards but traditionally used for coastal leisure and surf lifesaving. In fact there are many surf life saving competitions in countries such as New Zealand, Australia and South Africa that feature the surf ski, and wave ski racing is governed by the International Life Saving Federation (ILS). The safest and most fun way of getting involved in wave skiing is to take a training course with a shore based surf or activity centre. Most courses include equipment, such as the wave ski and wetsuit, as part of the package, and cover surfing and water safety too. Alternatively activity weekend, such as part of a stag party or corporate group, is a great way to get a simple taster of the sport, before committing to it more long-term. The big advantage of wave skis is that they perform equally well with or without waves and so beginners can get to grips with them on flat water before throwing themselves into the waves with wild abandon. A big advantage of wave skis is their natural buoyancy and so they are not only a fun piece of kit but a safety aid too. Many riders strap themselves to the board as it gives them stability and control, but it also means they are secured to their potential lifesaver. Wearing a belt however means that riders cannot wear a lifejacket, but it should be superfluous with the belt. Riders who don’t want to be strapped to their craft must wear a lifejacket. Take Off – A wave approaching a beach is at its steepest just prior to breaking. The surfer paddles down the steepening face until the ski begins to plane. The ‘take off’ can either be straight followed by a bottom turn or angled, leading into a shoulder run. Bottom Turn – After dropping straight down the wave face the surfer executes a smooth turn on the flat water to direct the ski back up the wave. Pull Out – The ski is ridden over the back of the rising wave prior to it breaking. The rider is then facing seaward and ready to paddle back out. Before heading to the beach, it is important to check the local weather and shipping forecasts and not risk a session on the sea if these are adverse. If the forecast is good and the trip is going ahead as planned then somebody should be informed about the wave skier’s whereabouts and the expected time of return.